…featuring the Survivors. The Earth has been destroyed. A group of young specialists have been sent out into the void of outer space to seek out an Earth-like planet and are charged with the reconstruction of mankind. “In the Beginning…” Story and art by Steve Woron, Inks Karl Kesel and Bob Lewis. 40 pages, black and white, 8-in x 10.75-in. Cover by Darla Addley. Inspired by the rising quality of the X-Men by Claremont and Byrne at the time, I pitched an idea for my own comic about a group of hand-picked people shot into outer space to reseed the human race. The prospect of publishing a comic intrigued Cheryl to no end. I said that I wasn’t just interested publishing a comic, I want to start a comic company featuring creator ownership titles! Native and resident of Connecticut, Steve Woron co-founded one of the first comic/ art's independent publishers. Since 1982 Steve help create the "ground floor" for thousands of independent publishers of limited edition art and other printed collectibles and publications. His companies The Illustration Studio and The Image Guild still publish fantasy art today. 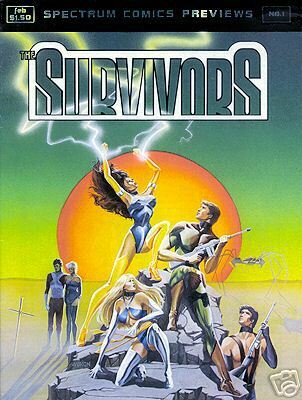 This entry was posted in General News, History of TIS 1982-1990, Publications, Steve Woron, Survivors and tagged Bob Lewis, Comic Books, graphic novel, illustration Studios, Karl Kesel, limited edition, Mostly Books, Sprectrum Comics, Steve Woron, Survivors, T.I.S., the illustration Studio, TIS. Bookmark the permalink. Oh, I loved Mostly Books! Do you remember what their general street address was? I remember walking like an hour to get there from West Hartford…I’m curious to see on a map how far it really was! Now that I think of it, I did pick up the first two issues of Survivors at that store!